Have you attended The Lead Developer conference? You've trained as an engineer but now you're a manager of engineers or a manager of managers. This new role requires a completely different skill set with a focus on "soft skills" to be a successful leader. The Lead Developer is an international conference for engineering managers, tech leads and CTOs, taking place in London, Austin and New York. The annual conference is full of practical takeaways to help you lead your team, build psychological safety, and support your team members to level up to leadership roles themselves. Our meetup is an extension of the conference for the community to get together, network and learn to develop yourself and your team. Featuring short talks and refreshments, it's the perfect opportunity for some mid-week inspiration. As with our conference, our meetup is a safe and inclusive space. 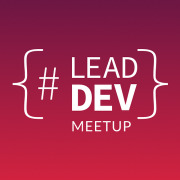 We expect all of our attendees to read and follow our code of conduct (https://theleaddeveloper.com/code-of-conduct). We make sure to use venues that are fully accessible for wheelchair users and those with mobility restrictions. To help make our meetup as welcoming as possible, we provide non-alcoholic drinks and vegetarian/vegan food options. If you have any specific accessibility requirements, please let us know and we'll do our best to make the necessary accommodations.